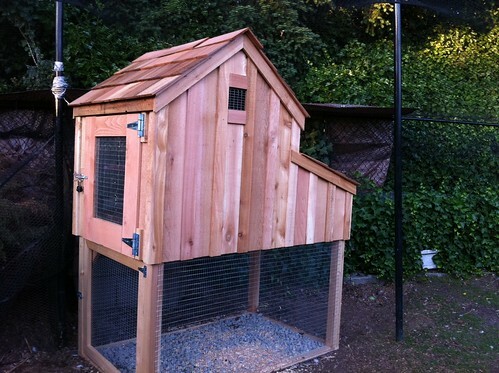 Today we bought a new, proper chicken coop for inside the aviary. If you’ll think back, we never meant to have chickens really. 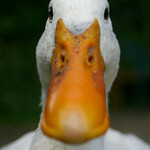 Two chickens came in with the handicapped duck we rescued back in 2009. And since then, chickens just keep showing up. They usually sneak friends in too. Never trust a chicken. This is what we’ve learned over the years. But the ones that are here, we love them. 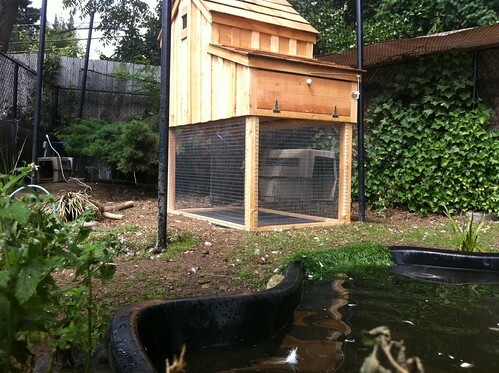 They’ve never had a proper coop because all our predator-proof pens are built for ducks. 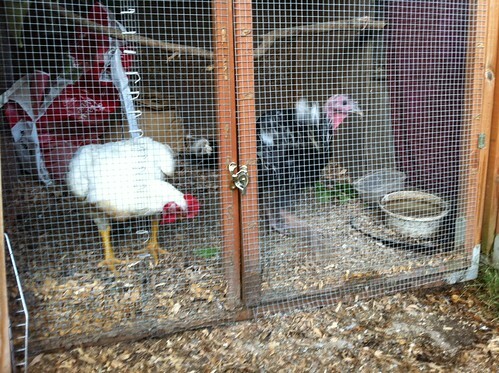 And right now we don’t have any space to keep Persephone Kerfuffle the turkey outside. 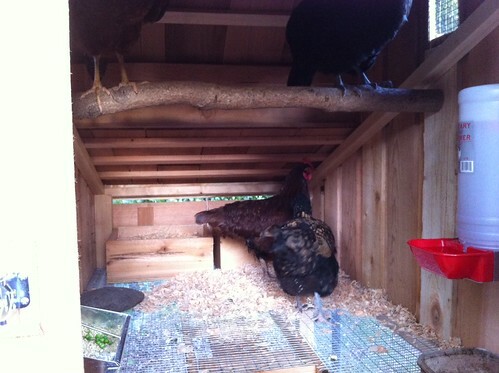 So we decided to put a coop inside the aviary, specially-designed for the chickens. It’s a beautiful coop by a company called Saltbox Designs. The owner, Berg, came over and built it on-site for us today, on short notice. 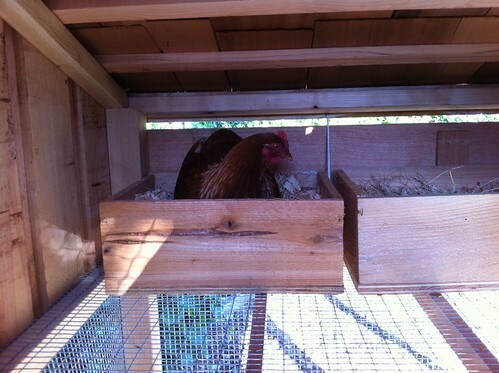 Little Cindy Buttons tested out the nest boxes, and she approves. She’ll be rooming with Ramona duck for a little while longer though, until the other chickens stop giving her such a hard time. 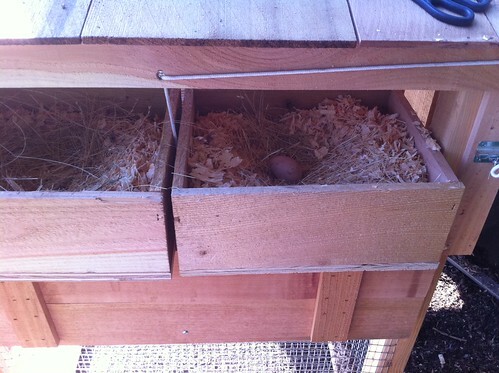 Aren’t the nest boxes cute? That’s a fake egg we put there so the chickens can get the idea. We bought some paint for the coop, and hopefully it works out okay. We’ll take another photo when it’s done. “Thank you for the real coop.” You are most welcome, Olly. You kids deserve the best. 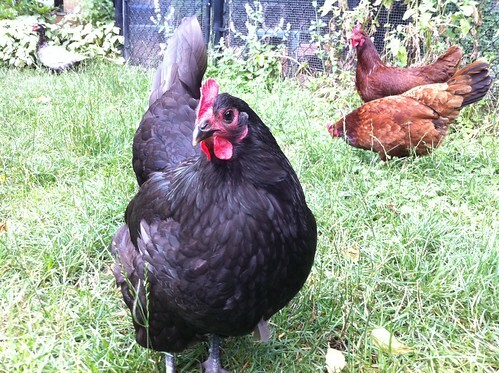 It’s about time you had a proper coop. And this means Toro roo and Persephone Kerfuffle are out of the dining room. Yay! They are spending their first night outside tonight, and the neighbor has decided to set off fireworks. Wish them luck. Lastly, Simon is hanging in there. He’s still not himself, and he has lost 2lbs in recent months (which we found out at the vet’s office). 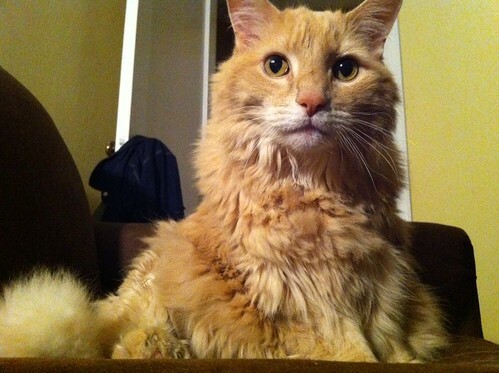 The note from the vet today said, “His labs indicated that he has inflammation or infection of some type… which we knew. While I cannot rule out something severe, like cancer, it is less likely, particularly since this came on suddenly. We should recheck his values in 1-2 weeks to make sure all is back to normal, presuming he is responding to treatment.” He really isn’t eating that well, and he is at least 15-years-old, so we know he isn’t going to last forever. But his purr machine is working well and he seems to be out of pain (he was in pain Thursday morning which is why we went to the vet Thursday eve). That’s it for today! Whew! Special thanks to Saltbox Designs for building a beautiful coop for the hens, and helping me get the turkey and roo out of my dining room!